Fredericton — Blessed be the New Brunswick Founding Fathers, the annual 120-hour Moose Purge began yesterday at dawn. Thousands of blessed ones streamed into the woods, eager to “release the beast” and quench their thirst for animal blood. Moose calls blare throughout the province to signal the start and end of The Purge. All deodorant, soap and razors remain unavailable to purgers for the entire 120-hour Purge. Purgers must clothe themselves in the hunters’ orange and camouflage… more than usual that is. Weapons of Class 4 and below are permitted for use. Class 5 weaponry (viral/biological and chemical agents) are only to be used for defoliation. 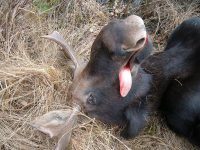 A public hanging of each purged moose takes place at the DNR office, ostensibly to weigh the kill. A solemn mob has gathered at most DNR offices to watch the fresh kills arrive. “I like to watch the bodies arrive,” confessed retired purger Reggie Orignal. “I like to stare into their dead eyes,” he added quietly. After the purged one is processed by the government officers, it will be butchered so the purgers may feed upon the flesh of their kill. In 2016, more than 61,000 purgers applied to kill and 4,643 permits were granted throughout 27 kill zones. Purging will conclude at dusk on Sept. 24.